Introducing our newest addition to the Rocky Mountain Gobstoppers Line of Premium Elk Antler Dog Chews! The X-Large-Quarter Split elk antler Dog chew! 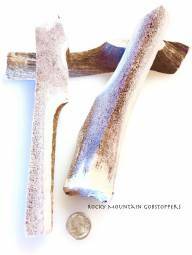 SMALL-WHOLE Rocky Mountain Gobstoppers are Premium Chews cut from fresh brown Top-Grade Premium Quality Elk antlers. PETITE-WHOLE Premium Chews are cut from Fresh Brown, Top-Grade and Premium quality Elk Antlers. 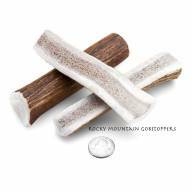 PETITE-SPLIT Rocky Mountain Gobstoppers are Premium Elk Antler Dog Chews that are cut from Fresh Brown, Top-Grade and Premium quality Elk Antlers.